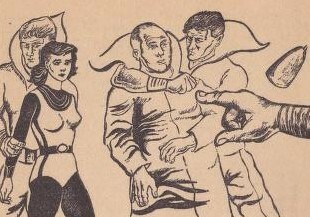 First appearance: Collier's, December 10, 1949. 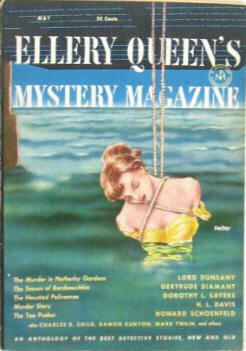 Reprinted in Ellery Queen’s Mystery Magazine, May 1952; EQMM (Australia), July 1953; and EQMM (U.K.), July 1953. Short short short story (1 page, 1 illo). "He could see when we were blind and speak when we were dumb." 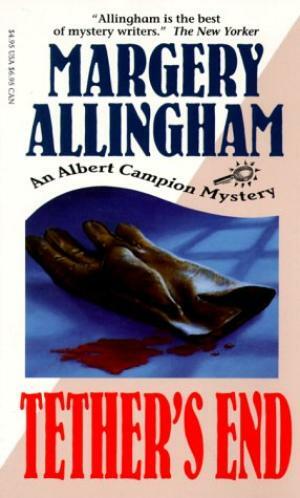 When a young woman inexplicably goes missing, the best forensic investigator on the case will be someone who's never heard of latent fingerprints, much less a gas chromatograph . . .
- FictionMags about William Meredith Cunningham: "Born and educated in Oklahoma; author of numerous detective stories in pulp magazines; active in leftist causes; director of the Federal Writers’ Project in Oklahoma; worked for Tass, the Soviet news agency in New York City 1940-1948." 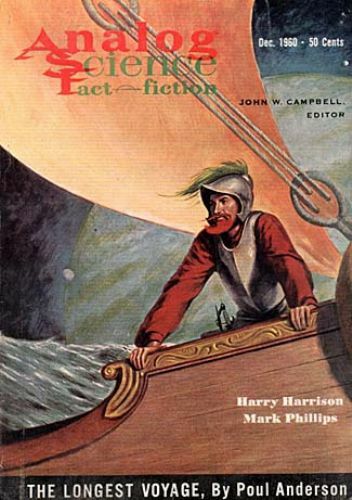 First appearance: Analog Science Fact-Fiction, December 1960. Short story (14 pages as a PDF). "A gun is an interesting weapon; it can be hired, of course, and naturally doesn't care who hires it. Something much the same can be said of the gunman, too. . . ."
Some jobs absolutely require a specialist . . .
". . . pressed the trigger. And at that moment, the universe caved inward upon Joseph Marie Prantera." "The bacterium of hate—a new strain—has found the human race unprotected from its disease." "The moment after you have accomplished your mission, we plan to turn ourselves over to the nearest institution . . ."
"In the near future, I may well need an assistant knowledgeable in the field of violence." - Probably more than you'll ever need to know about Dallas McCord Reynolds is (HERE), (HERE), (HERE; audios), and (HERE). 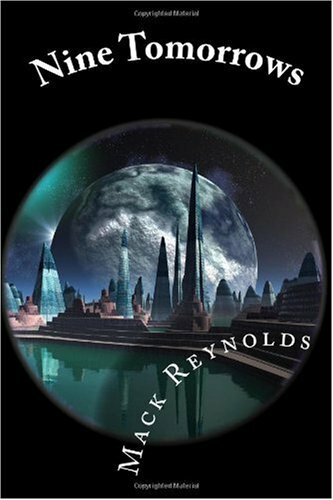 - Our last encounter with Mack Reynolds had him co-authoring a Solar Pons adventure (HERE). 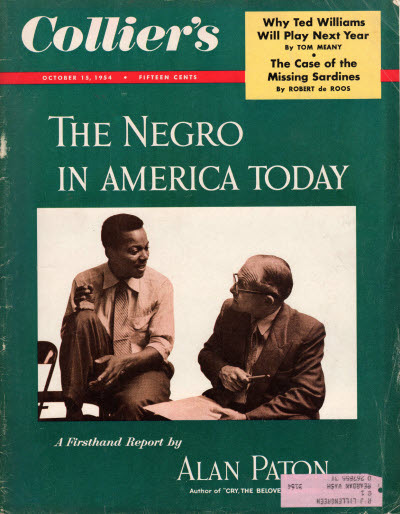 "It Became Cruelly Apparent That He’d Deliberately Committed Suicide"
By David M. Norman (Norman A. Daniels, 1905-95). 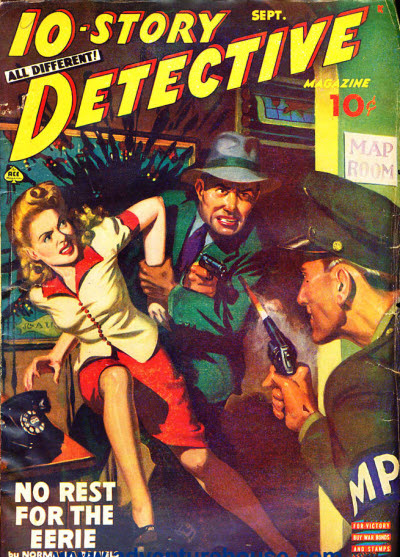 First appearance: 10-Story Detective, September 1943. "Steve Abbott didn't believe in ghosts. He was leery when the engineer on Number 74 claimed to have run over a ghost on the track. But when Abbott went out to search for a mangled body, he himself was railroaded into a séance with Satan." "Steve drew his gun and noticed that his hand shook badly. The ghost stood there, daring him to come closer. There was a certain wavering quality to the spectre. Then Steve really got a shock. . . ."
"It was his friend, dead for five years—killed close by in an accident. Midford—whom he had known so well and could never mistake. Midford seemed huge, towering, and he stayed right in the middle of the tracks." ". . . got under way in quick time, but he kept shaking his head from side to side. He couldn’t understand it. The man had been there, right in the middle of the tracks and yet there’d been no corpse, no blood—nothing." "Pop was talking funny just before it happened. Said he had a premonition or something. Maybe the poor guy has gone crazy." "All right, Joe, but the body didn’t just vanish. Even if it did, there’d be blood stains. This baby you pilot doesn’t tickle people she hits." "I didn’t see anybody, and I watched you roll through here. It’s the only excitement I ever get in this forsaken spot." ". . . a railroad detective, didn’t know too much about homicide. He was no city cop with laboratories at his command, or hundreds of men to help check details. He was virtually alone." Typo: "a man's fun attention". 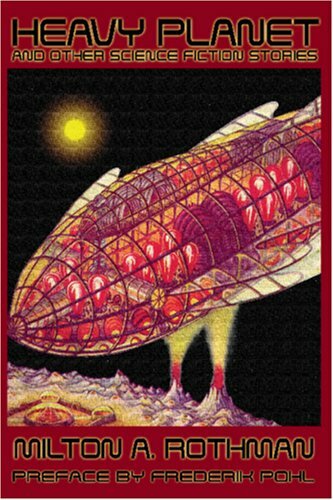 - We have a more comprehensive posting about uberpulpster Norman Daniels (HERE). (1) February 8: "The Missing Pullman Car" - (HERE). (2) February 27: "The Ends of Justice" - (HERE). (3) March 15: "The Night Express: The Story of a Bank Robbery" - (HERE). (4) March 16: "One Foggy Night" - (HERE). 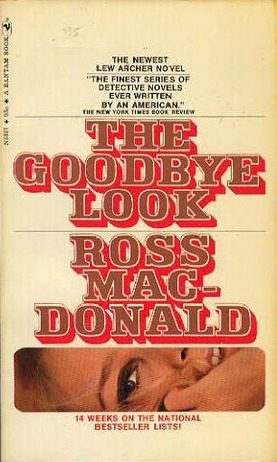 (5) April 3: "A Terrible Railway Ride: The Story of the Man with the False Nose" - (HERE). (6) May 11: "In the King Row" - (HERE). (7) August 15: "High Iron Rolling" - (HERE). (8) September 14: "In the Rockhurst Tunnel: The Ganger's Story" - (HERE). (9) November 21: "The Knight's Cross Signal Problem" - (HERE). For a 2017 list, go (HERE). problem solvers extraordinaire; but they don't get involved in your garden variety problems—oh, no, as you'll see in the following, their only adventures as far as we know. "They found Spigelli unconscious upon the floor with all the evidence lying beside him." 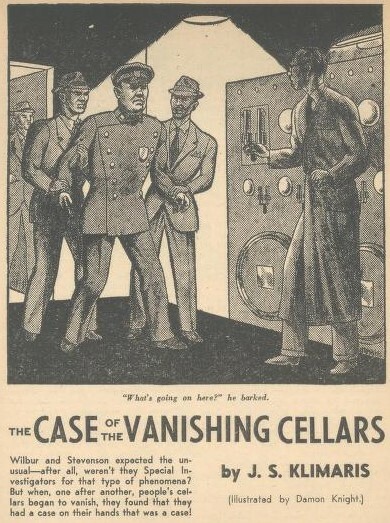 "The Case of the Vanishing Cellars." 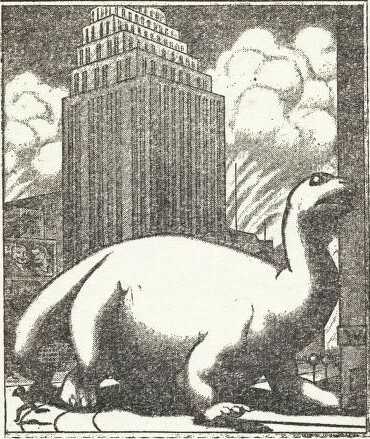 By J. S. Klimaris (Walter Kubilius, 1918-93). 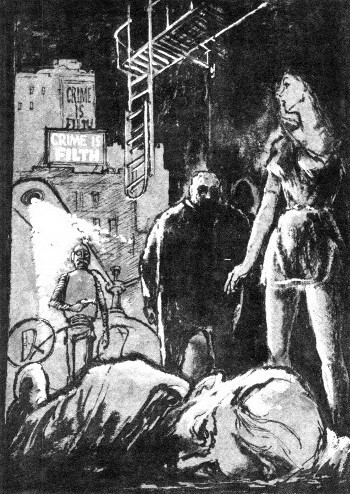 Illustration by Damon Knight (1922-2002; HERE). 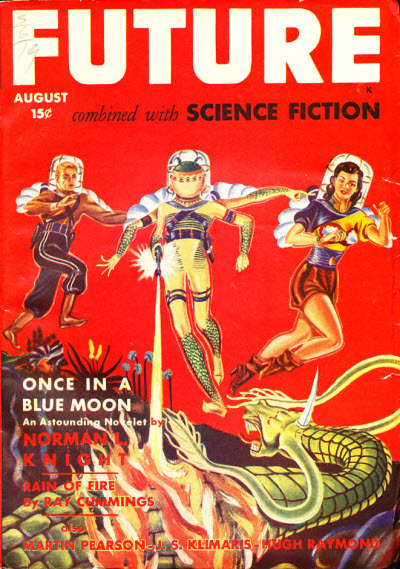 First appearance: Future Science Fiction, August 1942. 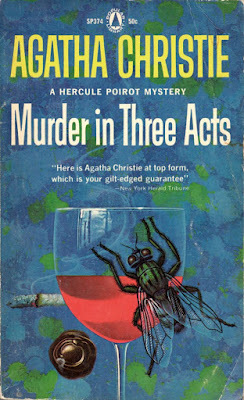 Reprinted in Double-Action Detective and Mystery Stories, May 1960. 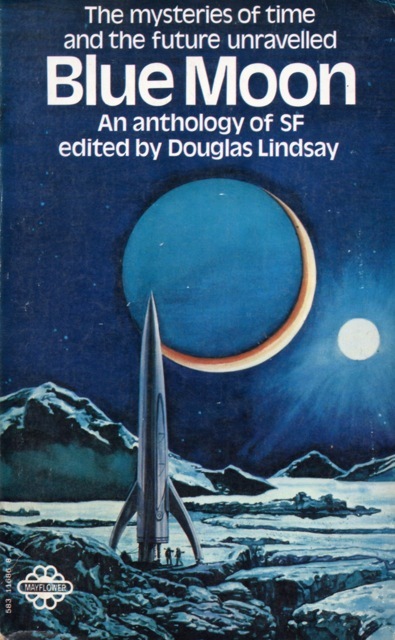 Anthologized in Blue Moon: An Anthology of Science Fiction Stories (1970). 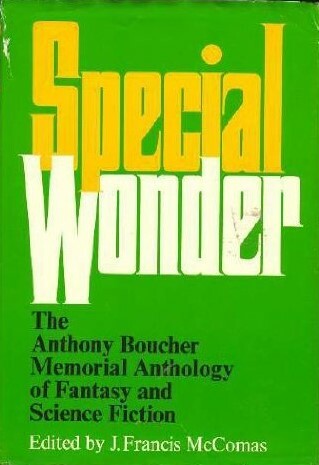 "The Society for the Investigation of Unusual Phenomena has had a great many strange cases, but has never failed yet." 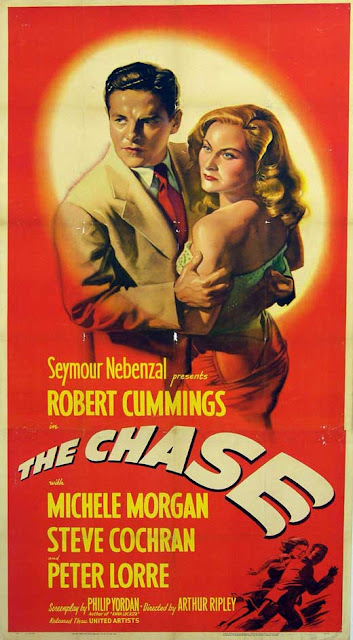 Extreme situations can necessitate extreme measures, such as Wilbur and Stevenson—gasp!—breaking into the City National bank . . .
"I make wine and then store it away. Last night I lock the cellar door, and this morning—no cellar. No wine! No nothing!" "We'll do the best we can for you. If it is possible to find your cellar, we shall do it." ". . . notorious counterfeiter, whose ten dollar bills could be found in 30 out of 48 states. . . ."
"The war! What war? Who’s interested in a war at a time like this when cellars are vanishing all around us?" "You can't pull that gag on me." Typos: "his giant shadow [missing was] thrown across the room"; "epitomy"; "aske Wilbur". 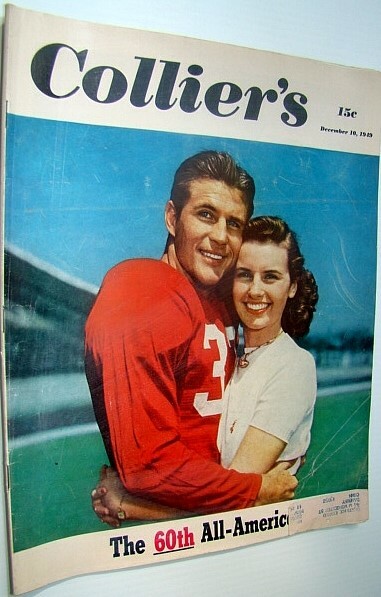 "Many women fainted. Brave men paled." 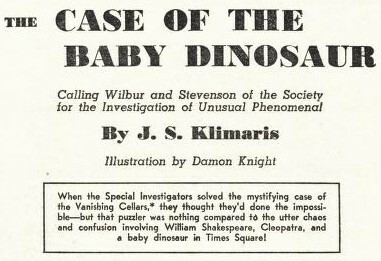 "The Case of the Baby Dinosaur." 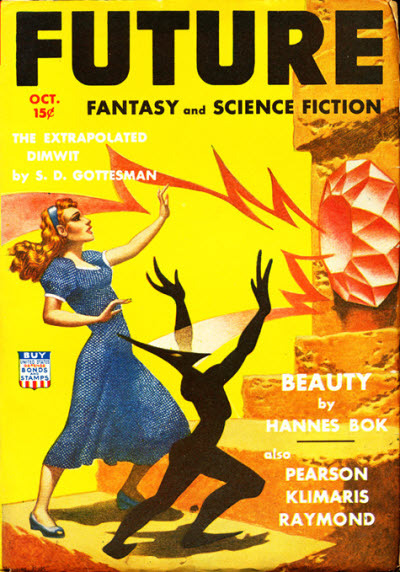 First appearance: Future Fantasy and Science Fiction, October 1942. 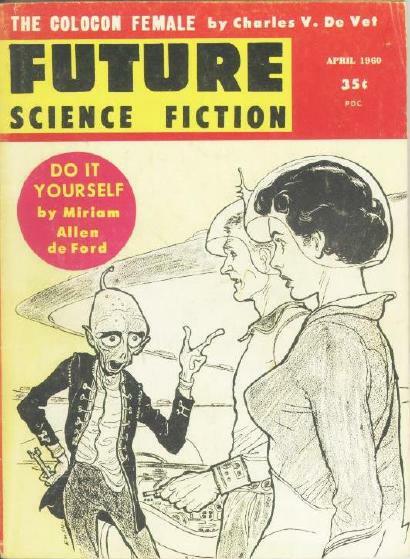 Reprinted in Future Science Fiction, April 1960. "If the Society for the Investigation of Unusual Phenomena doesn't do something—we are lost." When it comes to dealing with a crisis, much has been written about how the denizens of the Big Apple cope. Perhaps Douglas Adams put it best: "The last time anybody made a list of the top hundred character attributes of New Yorkers, common sense snuck in at number 79." 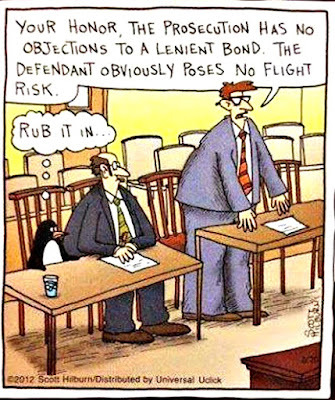 Fortunately, Wilbur and Stevenson are the exceptions that prove the rule . . .
"It is to the credit and quick thinking of Police Commissioner McClury that disaster did not strike in the heart of Times Square." "I'll have you hanged by your toe nails and your heads used as brooms to sweep the side-walks if I don't get some action on this case and get it fast!" "We're in a jam, son, and unless we do something about it we lose a good job." "That would be most regrettable." "Yeah. That's what I said." "She lifted her head high and yelped triumphantly and felt within her the stirring joy of arriving at maturity." "I have been rather irritable lately, and your sudden appearance annoyed me." ~ . 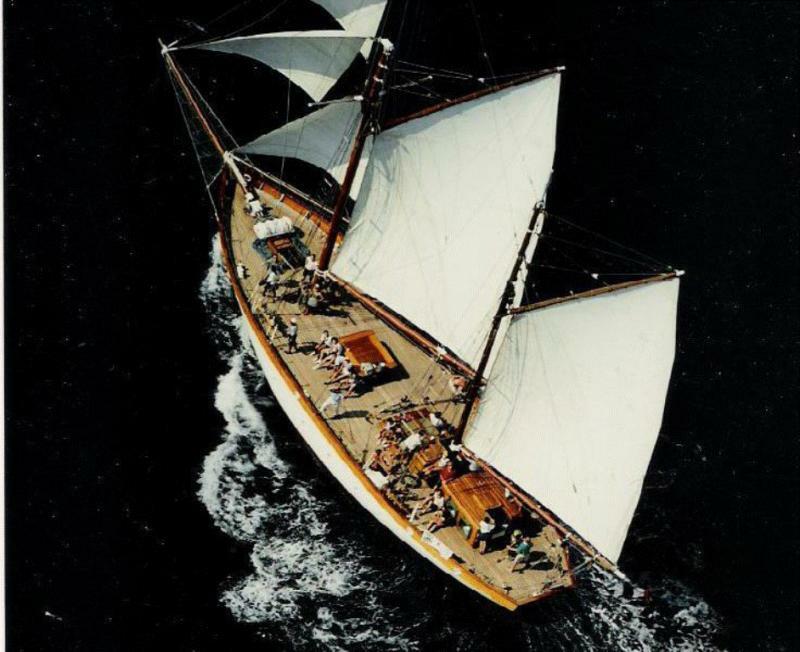 . . as well as a famous playwright, a ship complete with oarsmen, Caesar's main squeeze, a hero of the American Revolution, and a number of others, some not so well-known to history. a converted ambulance? And what about the name of that inventor? 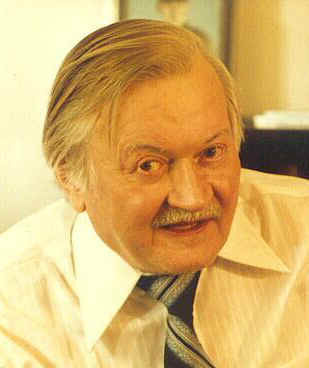 - Walter Kubilius normally hid behind the "J. S. Klimaris" byline; see (HERE), (HERE), (HERE), and (HERE). 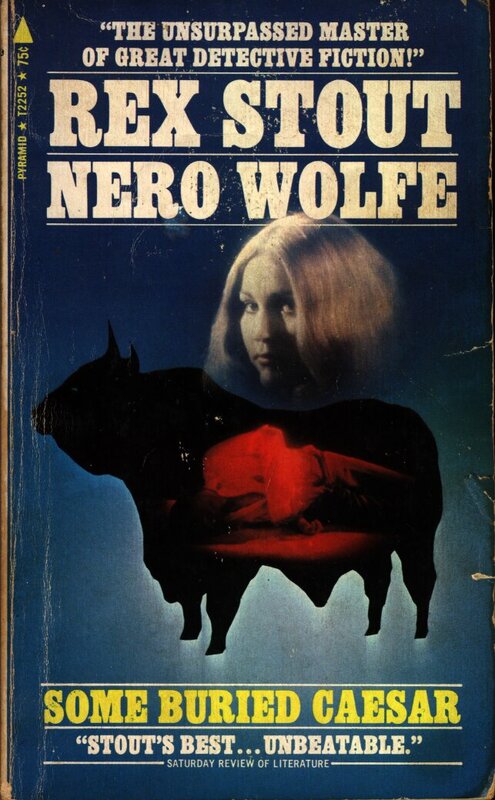 "I Was Only Conscious of a Dark Cloud Obscuring My Sight, a Dizziness in My Head, a Trembling Sensation in My Knees, and the Consciousness of Falling, Falling, Falling, Until It Seemed That I Would Never Reach the Floor"
"Three Theories of a Crime." By John J. Wall (?-?). 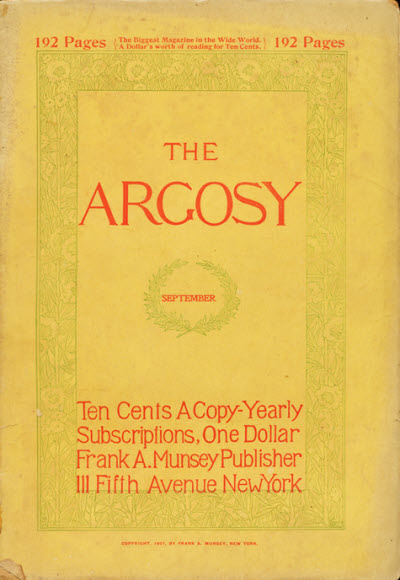 First appearance: The Argosy, September 1897. "The middle finger of his left hand was a stub!" Chapter I.—"The Search for Clues"
Chapter IV.—"The Arrest and What Followed"
Chapter V.—"Laying the Foundations for the Defense"
Chapter VI.—"Our Side Scores One"
Chapter VII.—"The Prisoner Begins His Story"
Chapter VIII.—"She Had Her Choice"
Did he or didn't he? Did she or didn't she? And what about that other guy? ". . . aged about twenty-two. Brunette. Beauty above the average. Found dead in room 47, Baxter Building, 8.30 P.M., October 4th, 188—. Bullet hole through heart." "The marks seemed more distinct. There were little dots where the fingers had lain, and the blood had congealed on either side, perfectly outlining the imprint of a hand. It was a man's hand, too, for the dainty little one of the murdered girl could never have left that large impression." "'Nothing to warrant an arrest in all that, Bright,' remarked the chief. 'It is sensationally circumstantial and undoubtedly points the right way, but you must have better information upon which to base a charge of murder.'" "I am unused to scenes of this character, and in all my life this is the first time I ever saw the interior or viewed the proceedings of a courtroom." "I did not see her face. She was heavily veiled." "It seemed to me that all I feared, as well as all I hoped, would turn eventually on that bit of evidence." ". . . I solemnly swear that if you ever leave me in that way, or prove faithless to the vows you willing pledged the day you wed me, I will strike you dead!" Comment: We'll leave it to you to decide whether or not our author has successfully managed to stack a police procedural on top of a courtroom drama and to finish it all off with an over-the-top melodrama; regardless, we do like the finale. Typo: "if did not visit her" [missing "I"]. 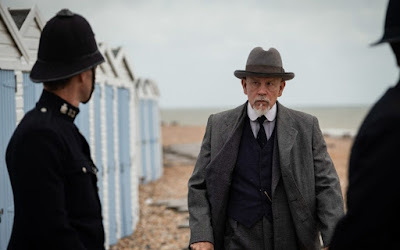 - The FictionMags index lists "Three Theories of a Crime" as John J. 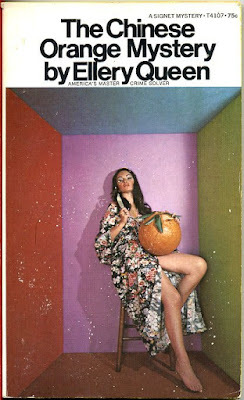 Wall's only credited story discovered so far, nor can we can find anything else about the author. "There was a wonderful moment while the world was filled with beautiful stars and streaks of lightning through which he heard distant police sirens. But the wonderful moment didn't last long and darkness closed in on him." By Richard R. Smith (born 1930). 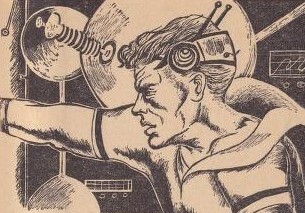 First appearance: Galaxy, May 1958. Online at Archive.org (HERE; text faded) and Project Gutenberg (HERE). "Going straight meant crooked planning. He'd never make it unless he somehow managed to PICK A CRIME." Seriously, what's a guy got to do to get arrested? "He wanted to spit his contempt, but the increasingly familiar pain and voice prevented him." "You stupid jerk. 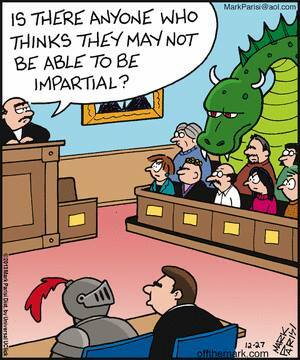 What do you think this is—the Middle Ages?" "I'm doing you a favor, Joe. I'm trying to explain something you're too dumb to realize by yourself." Comment: "Pick a Crime" is a fine example of what SFF does best, take a "what if?" situation and run with it. 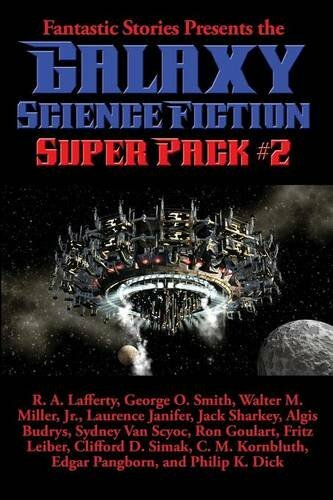 - Richard Rein Smith has been involved with SFF for quite a while; see the SFE (HERE) and the ISFDb (HERE) for more. 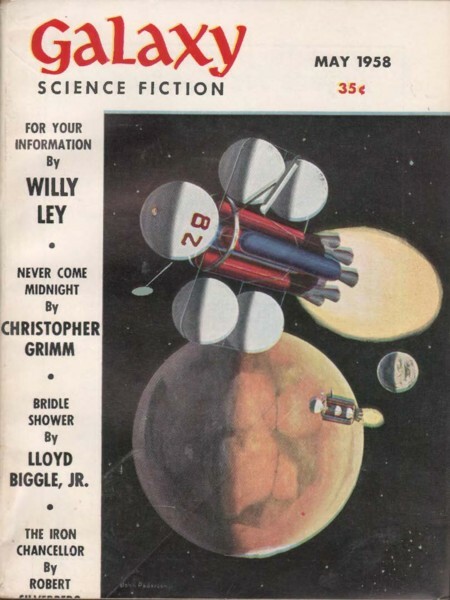 - We've encountered other cultures that use high tech (and tend to go a mite overboard with it) to bring order to their crime-ridden societies, among them: Colin Kapp's "Crimescan" (HERE), Lewis Padgett's "Private Eye" (HERE), Lloyd Biggle's "Cronus of the D.F.C." 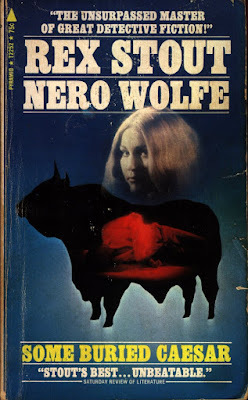 (HERE), Ian Whates's "Browsing" (HERE), Philip Ball's "When the Music Ends" (HERE), David Berreby's "The Punishment Fits the Crime" (HERE), and (on a lighter note) Greg Bear's "RAM Shift Phase 2" (HERE). 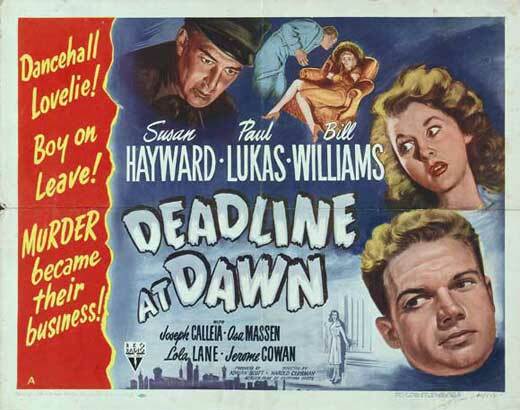 For the first part of this OLD-TIME DETECTION review, please pop over to Steve Lewis's Mystery*File (HERE) first and then return here for related links to additional information. 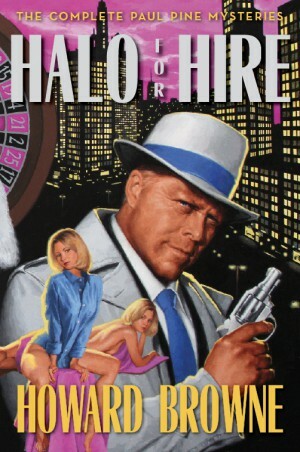 (1) A review (2018) by Michael Dirda of the omnibus edition of Howard Browne's PI works, Halo for Hire: The Complete Paul Pine Mysteries (2018). Related: (HERE), (HERE), (HERE), and (HERE). "Browne's four Paul Pine novels . 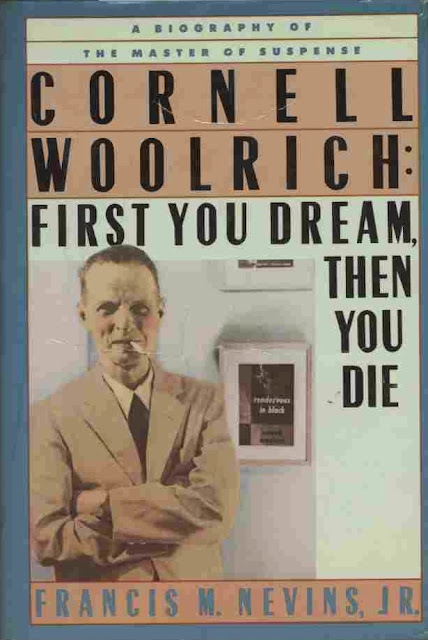 . . are quite consciously written in the wise-cracking, tough guy mode of Chandler's fiction and 1940s Humphrey Bogart films." 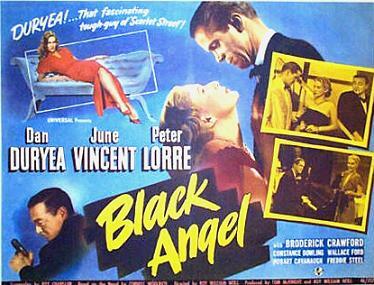 (a) Last Year's Blood (1947) by H. C. Branson. Related: (HERE), (HERE), (HERE), and (HERE). 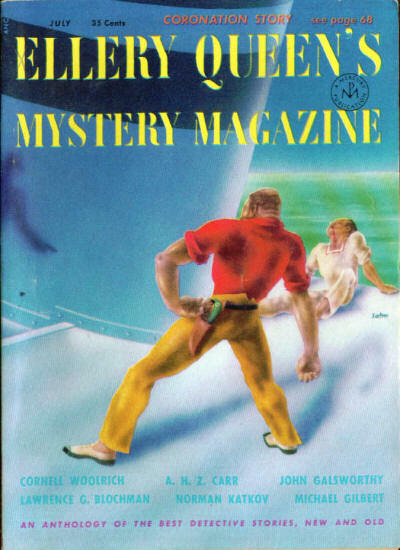 (b) The Longbridge Murders (1945) by Moray Dalton. Related: (HERE). (c) Too Good to Be True (1948) by J. F. Hutton. Related: (HERE). (3) "Author Spotlight: Jack Ritchie" by Francis M. Nevins (2010). Related: (HERE). 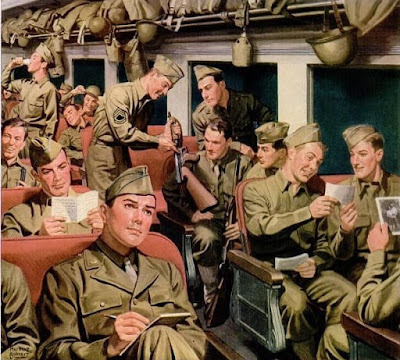 (4) "One of My Favorites: Jack Ritchie" by Arthur Vidro. (5) "Author Spotlight: Edgar Wallace" by J. Randolph Cox. Related: (HERE), (HERE), and (HERE). (6) "The Fingernail," a teleplay by Charles Shibuk based on the 1941 short story by Cornell Woolrich. (7) "The Woolrich Films," Part IV by Francis M. Nevins (from his 1988 book). Related (BEWARE of SPOILERS): (HERE), (HERE), (HERE), and (HERE). (8) "Christie Corner" by Dr. John Curran. Related: (HERE) and (HERE). 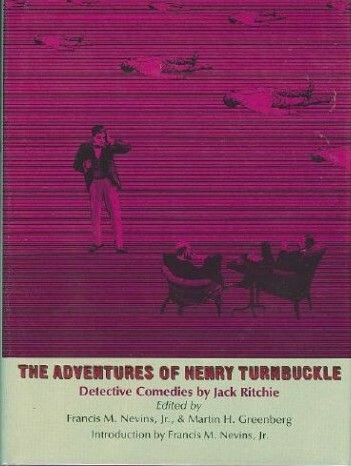 (a) Arthur Vidro's review of Jack Ritchie's The Adventures of Henry Turnbuckle (1987). Related (HERE) and (HERE). 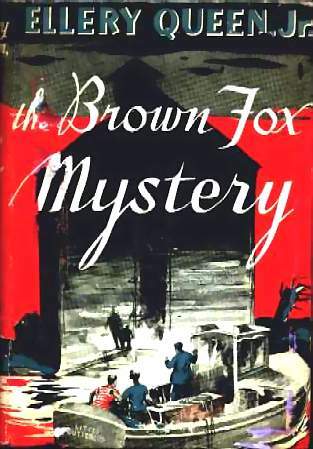 (b) Trudi Harrov's review of "Ellery Queen, Jr.'s" The Brown Fox Mystery (1948). Related: (HERE). (c) Amnon Kabatchnik's review (1974) of S. John Preskett's parodic Murders at Turbot Towers (1937). 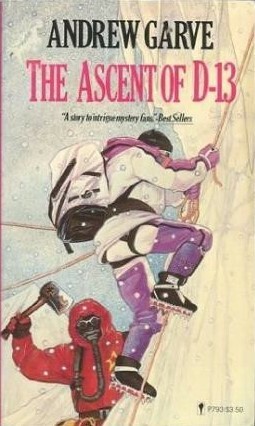 (10) "My First Great Detectives" (1980) by Jon L. Breen. Related: (HERE). (11) "The Paperback Revolution" (1970) by Charles Shibuk. 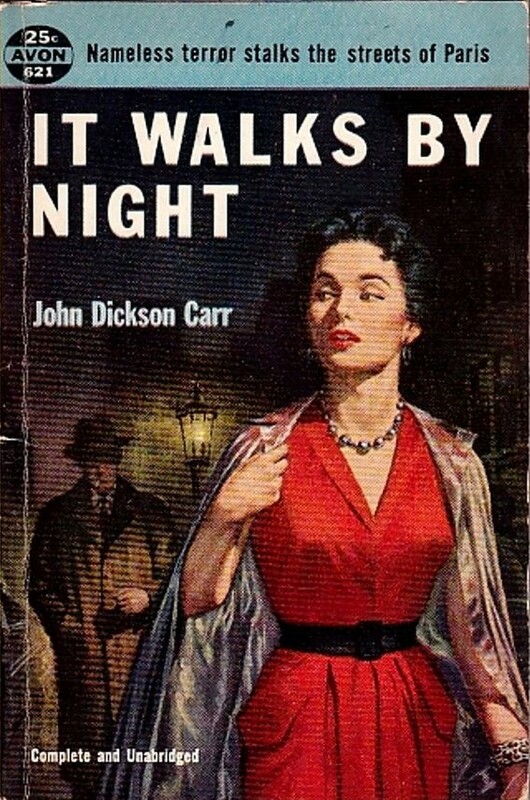 "What's wrong with modern mysteries? How about the obvious fact that they contain every aberration known to man . . . and some of the writing is by devout enemies of the English language." By Ward Holm Tanzer (1910-97). First appearance: Collier's, October 15, 1954. Online at UNZ starting (HERE) and finishing (HERE; scroll down to page 76). Nobody could possibly anticipate that the clue which will break this case open is "a pepper mill with some salt in it." set in a gentle brown face." "About fifty years old and rather rich." "MacKenzie, a retired ichthyologist, had not been able to give any worth-while information about Allbright's visit to Tahiti; the only fact of any possible interest that Airplane had got was an anecdote." "I will give you half the fine I laid upon the drunken American sailor last week. 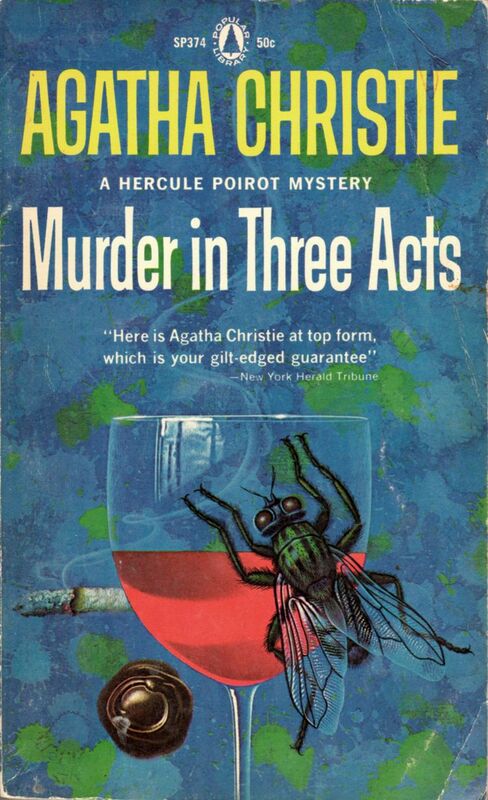 Plus a little pourboire of fifty francs if you should prove murder." "The hatch cover squeaked open. 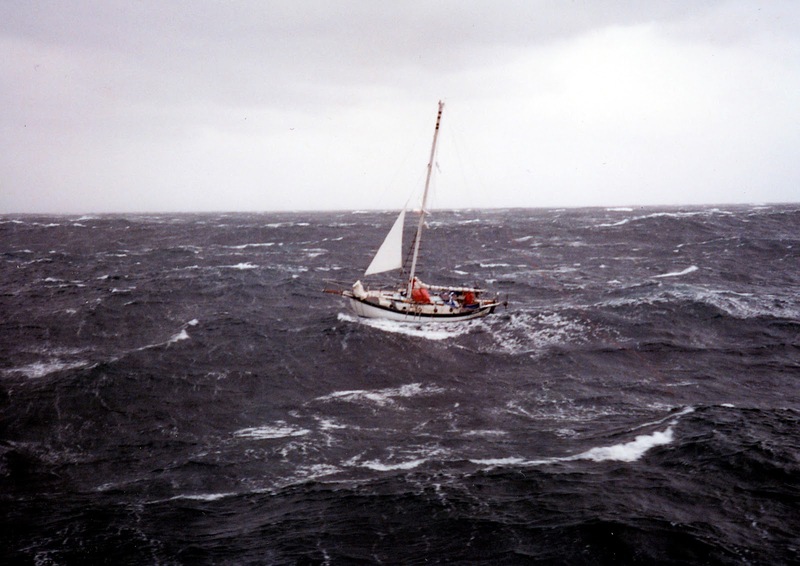 The head and sunburned shoulders of a heavily-muscled man in his thirties appeared in the companionway." "She was unlike any other woman Airplane had encountered in his seven years of knocking about the South Pacific and the sight of her roused his sense of curiosity." "This is what I get for mixing sentiment with business." 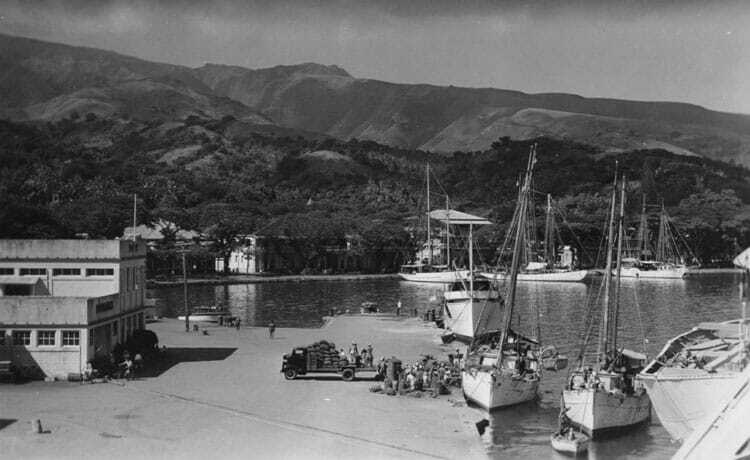 - FictionMags credits Ward Holm Tanzer, a California native, with two stories; his obit, which explains his familiarity with Tahiti, is (HERE). 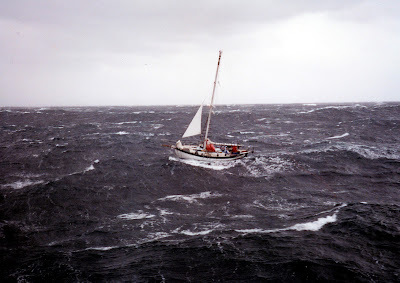 - Much of the story takes place aboard a ketch; if you're unfamiliar with that type of sailboat, see Wikipedia (HERE). "Under These Circumstances the Psychiatrist Must Become a Detective"
By Lee Gregor (Milton A. Rothman, 1919-2001). 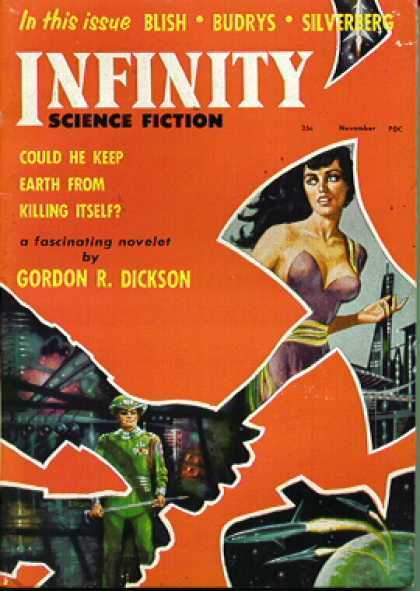 First appearance: Infinity Science Fiction, November 1957. "We have just seen the real beginning of psychological warfare." 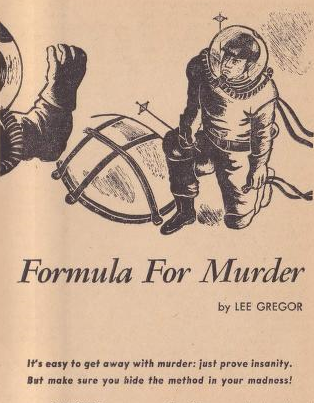 There's been a murder aboard a space laboratory orbiting a thousand miles up, and, based on all the evidence, the F.B.I. 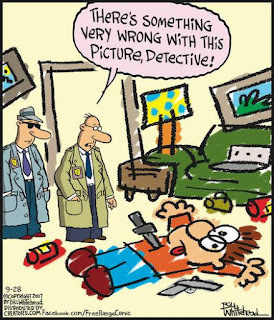 regards a young particle physicist as their prime suspect. After all, he was at the scene of the crime, he'd argued with the victim after being summarily removed from his research program on the ten-thousand-volt proton synchrotron after a year of hard work, and he even remembers doing it—a piece of cake for the psych team, with their advanced technology, to confirm; but they have to be sure because it's become a case of national security. To get to the bottom of it, two psychiatrists are forced to take drastic measures that could prove fatal—not to the killer, however, but to themselves . 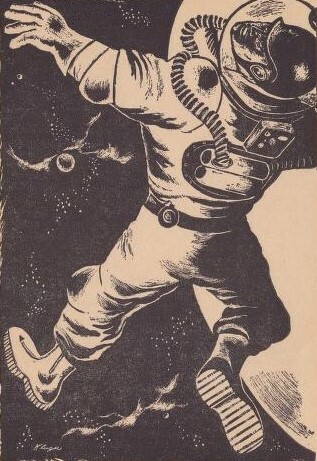 . .
"The figure of Professor Glover slipped from the surface of the space station and twinkled away among the stars." "He was several yards away when another spacesuited figure emerged from the port and helped him stagger the rest of the way. Inside the airlock he collapsed." "Now we find that he deliberately plotted to kill Glover, and the paranoid symptoms are now so intense that he gives us a completely phony story about making millions of dollars out of the discovery . . ."
"He might be making up this story to hide his real motive." "Well, I don't think it's an American. A bit too rich." "Don't malign them. They are good, loyal G-men. But they sat outside my door too long . . ."
"Obviously, Dr. Wolf, if security were involved, it is a matter I cannot discuss with you, especially over the phone." "I have a strangeness. A very great strangeness." 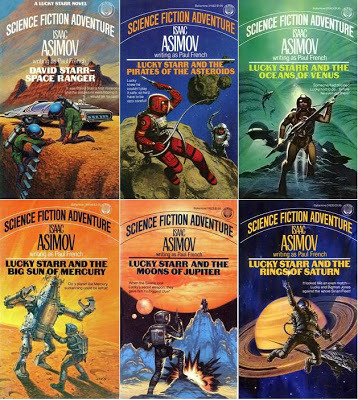 - Although Milton Rothman, a research scientist himself, is better known to SFFdom for his essays, he did generate science fiction stories over his long career; see Wikipedia (HERE) and the SFE (HERE) for his background and the ISFDb (HERE) for a bibliography. - A TV series episode with a somewhat similar setup but a wholly different plotline is discussed on Steve Lewis's Mystery*File (HERE).